Developments in computers and assistive technology have been of great benefit to all students, and in particular provide essential and significant help to students with dyslexia. Computer programmes can be used to assist the learning process. While there is no substitute for individual tuition from a trained teacher, computer programmes provide valuable reinforcement, variety and can increase motivation. There are hundreds of programmes available which can be used to practice reading, word attack skills, spelling and maths; there are also many assistive programmes which enable learners to access material, while others support writing and learning. Access to even a basic word processor with spell check can be helpful for many people with dyslexia. It removes the anxiety of writing with pen and paper, and it is much easier to make changes or reorganise the sequence of the written work. A spell check facility is also very helpful; it is easier and quicker than checking a dictionary and can be done independently rather than having to ask for help with a spelling. The AutoCorrect feature in Microsoft Word can be customised so that the individual can build up their own bank of commonly misspelled words. Good keyboard skills are essential, so it is important to learn proper touch-typing. Scanners, which allow text to be put directly onto a computer, and screen reading software which reads this material aloud, are extremely helpful to people who find reading tiring or difficult. Voice operated software allows the user to dictate directly onto the computer without having to worry about spelling which makes producing written work much easier and speedier. Tablets and smartphones can now be extremely useful tools for people with dyslexia. 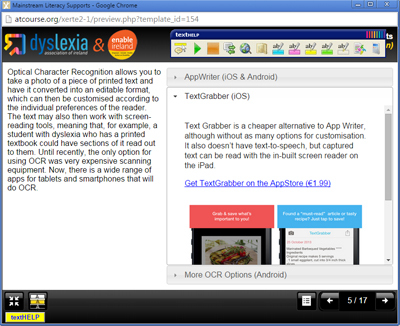 Many tablets and smartphones come with in-built screen reading and voice recognition features, and there is a vast range of apps available for all platforms to assist with reading, writing, spelling, organisation, study skills and numeracy. With so many programmes and products available, it is easy to become confused with the choice. Computer software can be expensive and comes packaged, so it can be difficult to find out prior to purchase if a product is suitable. Ways of obtaining practical experience of the software include advice from other teachers, demonstrations of software at conferences or exhibitions; it can sometimes be possible to get free 30-day demo or trial disks from suppliers or download them from the internet. Ideally the teacher, parent and most importantly the intended user should be involved in the process. It is also now nearly always possible to find demonstration videos online for virtually any piece of equipment, software or app. It is always worth checking if the makers of the product have demo videos on their website, or a YouTube channel. If not, you will almost certainly be able to find a video just by searching for the product name on YouTube. Currently, for primary or second level students with significant dyslexia, whose literacy skills are at the 2nd percentile or lower, the school can apply to the SENO for a computer/laptop and any specialist software needed by the individual student. If a computer and/or software is bought by parents or an individual for home/personal use, the VAT can be claimed back, using Form VAT 61A, from the VAT Repayments Section Tel. 047 81425. The form can be downloaded online from www.revenue.ie. Enable Ireland AT Service and the Dyslexia Association of Ireland have collaborated to produce a free learning resource outlining free and low cost apps and software to support literacy. This short eLearning module should be of interest to parents, students, teachers and other professionals working with people with dyslexia. To access the module just follow the link below and click the “Login as Guest” button. This free module is available in a number of formats if you would like to use it on your own blog or website. It is also available in SCORM format for use in schools or colleges own Learning Management Systems (Moodle etc.) (contact kokeeffe@enableireland.ie).